Vehicle is a 2000 F150 4x4 with a Lightning conversion. Fully built 2V 5.4 with 3.4 whipple. 800 miles on my current build. Bank 2 is .5-.6 leaner than bank 1 during part throttle open loop acceleration. * Replumbed my fuel system and Incorporated a y fitting with equal length hose to & from each rail. Fuel rails are plumbed in parallel. *Cams were degreed using cam events, not the intake centerline method. Cloyes hex adjust gears. Last edited by painlessauto; 09-12-2018 at 08:52 AM. Before I finished reading your post I was going to suggest a potential difference in cam phasing bank to bank Matt but with your compression numbers are as close as they are that eliminates cam phasing. I am thinking that you might not have a real bank to bank AFR difference, it might be a perceived difference being created by a whoopse in the exhaust plumbing. Because you observed the difference persisting after you swapped the wideband sensors bank to bank I am suspicious of a small air leak somewhere in the exhaust plumbing. Both sensors showing the same AFR difference on the same bunk makes me think you have a pinhole sized air leak somewhere in the exhaust plumbing. At less than WOT a pinhole sized leak can allow small amounts of air to enter the exhaust system that the wideband will read as lean when you really are not. When the engine is under load the higher sustained pressure in the exhaust forces exhaust gasses out the leak so the apparent discrepancy disappears. Have you tried smoking it or otherwise leak checking it? I have not smoked the exhaust yet. Shortly after posting this thread I began thinking about the exhaust side of the equation. My upstream and wideband oxygen sensors are mounted very close together with a partial overlap. I am thinking that the wideband is receiving dirty airflow caused by the upstream sensor. I am using v-band flanges so I suppose there could easily be a small air leak at lower rpms. I am more and more suspicious about the potential presence of a pin hole leak, Matt. Taking it out in the am, hoping this nips it. I could see carbon along the entire inner edge of the v-band clamps. They were definitely leaking. I bought two different gaskets. 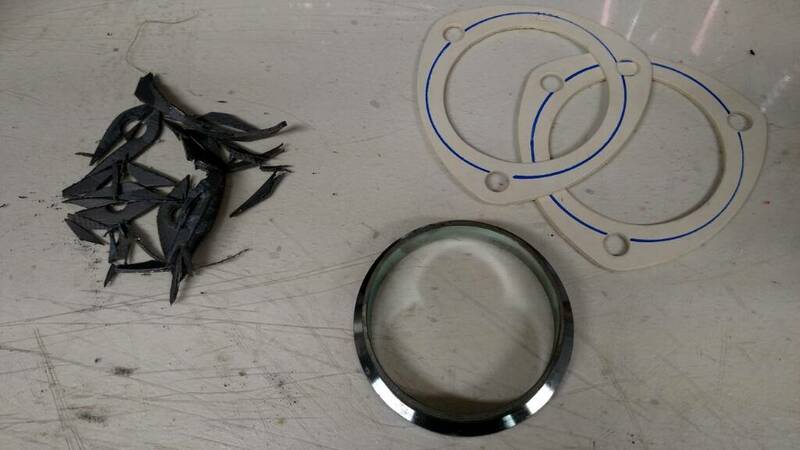 Ended up using the metal core graphite gaskets rather than the solid fiber gaskets as picture. Dollars to donuts you just nailed it, Matt. On to the next idea, whatever it is. Running out of them. About to tune off bank 2 for partial throttle open loop. Then tune off bank 1 at wot. Last edited by painlessauto; 09-13-2018 at 10:01 AM. Hmmm, I'm starting to run out of ideas also, Matt. This is a diagram with the four common plumbing models for a return style system. The manifold reference vacuum line is missing in all four illustrations. From your comments I believe the version you are using is version D. Normally I would expect the FPR to equally pressurize both rails with this configuration. If it did not at part throttle then I would suspect some type of flow difference from entry port to entry port on the FPR at low flow rates. The model I prefer is Version B with a small balance tube (-3AN or -4AN) across the end of each fuel rail to normalize the fuel pressure pulses at the ends of the rails. Each time an injector fires it is an abrupt opening and closing event that produces a shot of fuel for the particular cylinder and pressure pulses that echo up and down the rails. The balance tube at the end of the rails mutes but does not eliminate the waves. I don't think the pressure waves however, are the source of your AFR differences. The commentary was more a way of explaining my reason for using the balance tube. The benefit of the version B plumbing is that should the FPR exhibit low flow differences port to port they will be invisible to the injectors because only one port is fueling both rails. The other port is being used to receive fuel from the pump and the -6 is being used to return excess fuel. All injectors will see the same fuel supply attributes with this plumbing model. I know replumbing is a PITA so my suggestion would be to use the replumbing option as a last resort assuming another fix couldn't be found. I had version D but recently revised it. It now has a y after the rails which provides equal length hoses off the rails. I re-plumbed in inlet and outlet side of the rails last week. Last edited by painlessauto; 09-13-2018 at 11:28 AM. Change of heart here, Matt. I had forgotten all about that thread! A horizontal line (missing) through the center of the pic would correspond to the base fuel system pressure. The trough in the pic corresponds to the reduced fuel rail pressure at the firing of an injector. The peak in the pic corresponds to the increased fuel rail pressure when the injector pintle slams shut. Each injector creates one of these waves each time it fires and they continuously propagate up and down the fuel rails while the engine runs. If you are unlucky enough a trough arrives at an injector just as it opens and the fuel delivery is off by a whisker — say 0.5 AFR? The balance tube across the front of the rails does not eliminate the pulses but it does mitigate them. When Cammed03Whipple added his line, his lean condition (which was much worse than yours) disappeared. I suspect if you plumb like Version B and add a balance tube to the ends of the fuel rails your lean condition might disappear also — that's the good news. The bad news is plumbing can be a PITA but it might just be worth a shot. The poor fueling is not good for the engine or for your satisfaction driving the car because it is occurring in an rpm range you are likely to spend more time driving in. I don't mind the plumbing change. I really won't be that bad based on how my system is currently configured. Probably take me an hour to make the change. I already ordered the hose and fittings. Really hoping this nips it. I am running an -8an balance tube so I don't have to replace my 180* fittings. I assume the larger balance tube will be OK? Last edited by painlessauto; 09-13-2018 at 10:45 PM. The larger tube will work fine, Matt. The smaller -4 was size makes it easier to"hide" the tube routing low in the front of the engine. Summit has -8 to -4 straight male adapters that are pretty inexpensive => -4AN to -8AN Adapter and it will make the front of the engine look much better.